The EPA has not yet approved any air duct cleaning products with biocide for cleaning the inside of ducts that are made of fiberglass. If you are planning to use such a chemical, make sure you don’t have fiberglass material on the inside of it. Biocide is a chemical that is applied in the ductwork in order to fight against bacteria, mold, and other biological growth. Ozone is another chemical that is often used by industry professionals to kill bio contaminants. This strong solution is a type of gas which is very reactive. It is said that this agent can easily be responsible for irritating the lungs if inhaled. The right choice of which one to use is undetermined. The use of ozone or biocide in cleaning air ducts has not been proven to be effective by any studies or research to-date. However, many people are afraid that these strong chemicals can become very problematic if released into the living spaces of the household and breathed in. Coming in contact with these chemical solutions may cause a huge health risk. The specified use of these chemicals is regulated by the federal government. These guidelines are usually found on the label of the container. These are appropriate uses for such chemicals, however, on that list it does not indicate anywhere that it is alright to use such materials for air duct cleaning. Biocide and ozone are considered a type of pesticide. 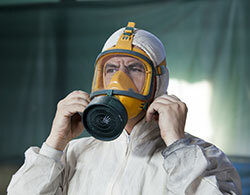 The law prohibits using pesticides in such a manner as ventilation cleaning. Only a few products on the market are approved for cleaning sheet metal which makes up air ducts. It is a slippery slope because there are products that are prescribed to clean bare surfaces. The inside of ductwork can technically be considered a bare surface.